Hydro-electric power is one of the oldest types of renewable energy. While it is very exciting and more desirable compared to fossil fueled generators, it is not without its own setbacks. Huge installations require a great deal of dammed water which result in destruction of the surrounding ecosystem. 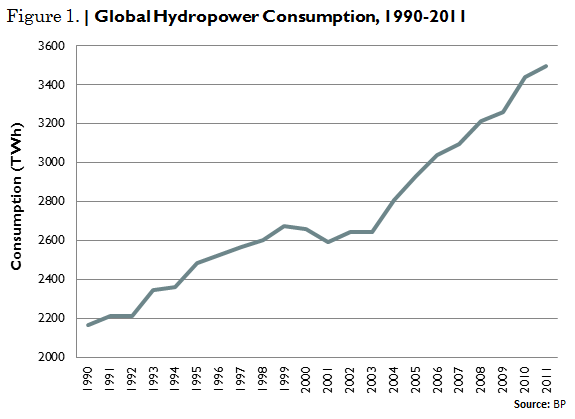 While solar PV and wind energy are two RE types that are gaining big momentum in the past couple of years, new research from the Worldwatch Institute suggests that growth in hydroelectric power development tapered in 2011. The institution said that worldwide consumption and installed capacity of hydropower have increased steadily since 2003, though the global installed capacity of hydro projects increased just 970 GW, or 1.6% in 2011 from the previous year. In other words, there's growth but at slower pace. Hydropower contributes less to the overall percent of energy usage in the Middle East, though that region experienced the greatest growth in hydroelectric consumption at almost 22%. North America followed, with an increase slightly below 14%. Meanwhile, usage in Europe and Eurasia fell by almost 9%, and by 0.6% in the Asia Pacific region. Still, "hydropower continues to be one of the most cost-effective renewable energy generation sources," Worldwatch Institute said, with typical costs in the U.S. ranging from $.02-.13 per kWh for existing grid-connected hydroelectric plants and $.05-.10 per kWh for new hydro projects. Meanwhile, micro hydro projects generate at about $.05-.40 per kWh. Putting things into local perspective, Malaysia's Small Hydro Power under the FiT scheme is paid RM0.23 - RM0.24 per kWh ($0.07 - $0.08 per kWh) for installations with capacity of up to 30MW. For bigger installations, rates are negotiable between TNB and the IPPs. On a larger scale, in Malaysia we have the mega project on hydropower in Bakun, Sarawak with design installed capacity of 2.4GW but it is still unclear if it has ramp up to its full capacity.